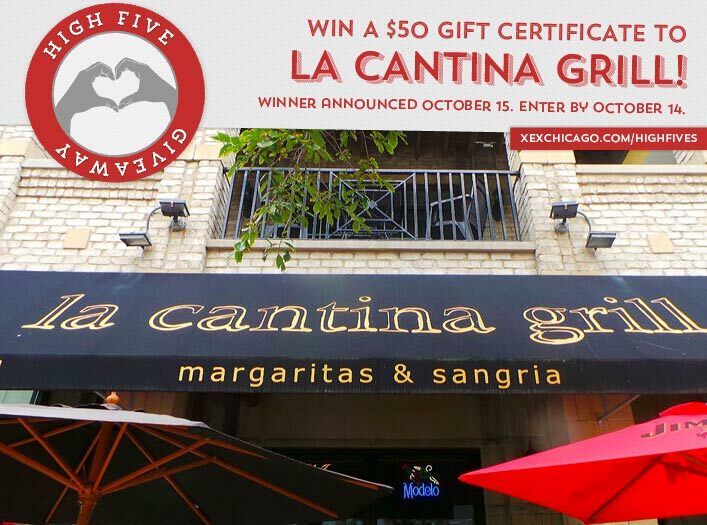 Win a $50 Gift Certificate to La Cantina Bar & Grill! Congratulations to Jaqueline Jasek on winning our 137th High Five Giveaway! Thanks to all who entered. Our next giveaway is for a $50 gift certificate to La Cantina Bar & Grill! La Cantina Grill is an authentic Mexican restaurant in Chicago’s South Loop near Soldier Field and McCormick Place. They were recently voted “Best Margarita in Chicago” by listeners of 103.5 KISS FM. La Cantina Grill is located at 1911 S. Michigan Avenue. Learn more about them and view their menu at lacantinagrill.com, or give them a call at 312-842-1911. What type of shampoo is Aveda releasing this November? Hint: Check out the last sentence of our latest blog post for the answer! Now, just add a comment to this post with the right answer to be eligible to win! The winner will be announced on Thursday, October 15. Enter by midnight on Wednesday, October 14! A new Aveda dry shampoo!